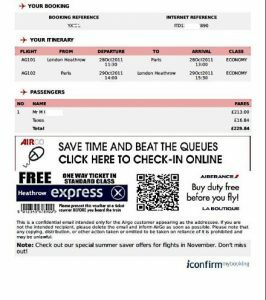 In 2015 and ongoing, there was a huge scandal in Britain about Boarding Passes Airport Shopping and Duty Free stores. The discussion surrounded how some airport stores were allegedly using your airline route data to recover the tax on your purchases, but to keep it for themselves and not pass it on. Showing your Boarding Pass at airport Duty Free Shops – necessary or not? The story went viral, even reaching South America, because for all travelers, the airport shopping concept is supposed to save us money. Being clear, this was a UK related story and one specifically referring to British airports, but what it did was open a Pandora’s Box as to whether airport Duty Free or Tax Free Shopping was good value or not. And, whether we, the public, were just being seen as targets to be ripped-off. The massive press coverage and even bigger social media comment spoke for itself. There didn’t seem to be many travelers out there who had much love for airports and their retail policies. Duty Free on Arrival is not here to defend airports, we are independent and do not work for them, nor for their retail Concessionaires. But, much of this problem is because few really understand the rules properly, not least the difference between Duty Free and Tax-Free shopping in Britain. The problem also came about because British airports and their Retail Partners had “muddied the waters” in relation to airport shopping, Duty Free and Tax Free. This happened when duty free shopping was abolished within the EU over 10 years ago as an initiative to keep their business going. In effect, they introduced one price on many products so that intra-EU travelers continued buying, but by doing so completely confused everybody as to what was really Duty Free or not. But, they could only do this by absorbing some of the sales tax (VAT) on the goods they sold. Since then many Airports, their Retailers, the Media and much of the Public still use the description “duty-free” as a euphemism for discount shopping. The problem occurs when these perceived discounts don’t happen or people are confused by the descriptions. This is what happened when the scandal broke and much of the Media were more interested in making a good story than properly understanding and explaining the Rules. Few, properly described the situation at the first attempt. The one Publication that did accurately describe the situation was the Travel Retail Industry Specialist, Martin Moodie. Show your Boarding Pass at airport stores – why? So, the global Boarding Pass firestorm occurred and yet nobody is much the wiser. Today, almost 12 months on, Britain’s Daily Telegraph reported how many airport retailers will now adapt a fairer policy. Apparently, a more detailed explanation is soon to follow. At the end of the day it is all about the price you pay and whether this is a bargain or not. The best discounts are on tobaccos, followed by liquors and by the time you move down the scale through Perfumes, Cosmetics, electronics, chocolates and gifts you will be moving towards paying more than normal on The High Street. Certainly for a soft drink, water, snacks or a sandwich. Let’s try and explain, so that you know the reality…..
– In British airports, certain stores are designated by Customs as a tax-exempt warehouse or “Export Shop”, such as those giant walk-through shops selling alcohol or tobacco, perfumes, cosmetics or gifts. This is what we all know and understand as a real “Duty Free Shop”. Check your Duty Free & Tax-Free Customs Rules, before you fly! – These Export Shops are technically split into (Excise) Duty Free supplies for liquors and tobaccos and all the other goods, which only have VAT (Sales tax) levied on them. They usually (or used to) show the description “Tax Free Shops”. – And these designated stores claim that they have to report and account their sales to Customs for everything they sell. 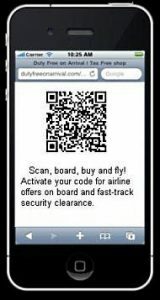 This is why they say they need to log your Boarding Pass at airport stores, check the details and scan it. The ambiguity is that there is no additional “Excise Duty” on Perfume or Chocolates. – The above stores have such a mass of different products with or without Excise Duty that there is some credence to why they need to log your travel details and account for all this to the Customs authorities. (For example they sell liquors to both EU and non-EU passengers from the same shop). – But, for other airport shops, like convenience stores, who might sell you cigarettes, newspapers or other outlets like fashion or electronic stores, they are really no different to shops you would find outside of the airport and Downtown. In an airport they can be defined as Tax-Free shops with permission. In reality, they are “discounted stores”, (or maybe not-so discounted stores), but for major Brands and their marketing, the use of the word discount is on a par with heresy. Hence why the marketing waters are muddied. – Some of these “Tax Free” stores can re-claim the sales tax (VAT) on the goods you buy, because you will be leaving the European Union on your trip. But they are not allowed to re-claim the Excise Duty on any cigarettes or liquor they may sell, regardless where you are going to. They are not allowed to re-claim the VAT for intra-EU travellers however, which is another reason why they want your flight details. The core issue is whether these “Tax Free” stores or convenience, pharmacies or gift shops are giving you back what you deserve. But most, if not all of them have one price, regardless of your destination. And so, who is actually getting the best of this one-price policy, the EU or the non-EU traveler? They would claim we are, because of the one price policy, whereas many travelers would see it that they are, because the shops are (or were) allegedly keeping the cream. If the price of a hamburger in an airport is anything to go by, I know where our vote goes! “Let the buyer beware” couldn’t be more appropriate than to those flying abroad and we hope that our extensive articles and explanations help you to be forewarned. Finally, don’t get confused with the Downtown shopping system, also called Tax-Free with Claim Booths at the airport. Tax-Free Refund Shopping made outside airports. 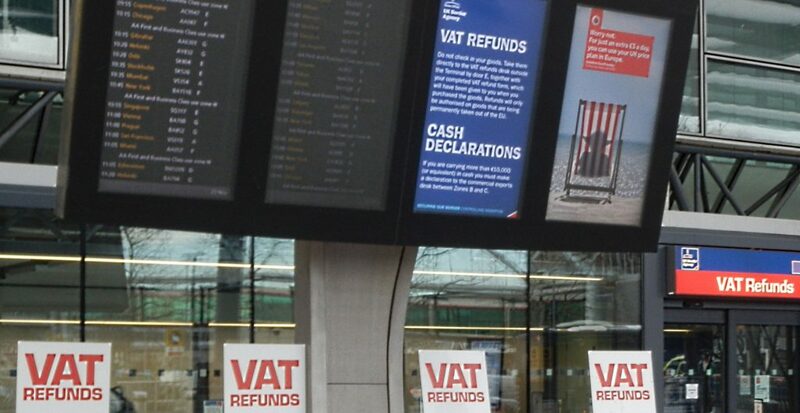 This is completely different to the airport stores and is simply a refund scheme where certain visitors can claim back the VAT before they leave the Country. But this applies to shops outside the airport on what you buy Downtown and is another complex issue, which we will deal with another day. The airport "Tax-Free"* issue is really all about what is known as "price positioning" by the various Stores in the airports. They can either sell everything to all, at the lower price, with the VAT refunds they get included in this lower price, or they can position prices at the higher tax-included price across the board. It seems highly likely that prices were positioned somewhere near the higher (taxi-included) level, so to give the impression of a bargain and a discount all round to all passengers. More than likely, prices were averaged, firstly to attract EU shoppers, where they still have to include the VAT and then the tax that retailers' recovered, is then used to offset any losses on this average price. The simple answer would be dual-pricing, EU and non-EU, which is exactly what the genuine (Duty Free) "Export Stores" do on Liquors. The problem is they do not seem to be doing this for other products like Perfumes. Some of the other "Tax-Free" airport stores seem to be pricing as they see fit for the market and basing their airport prices on what is known as "the recommended retail price". i.e Find the highest price in a normal store in the local High Street, then discount back so to claim and look cheaper in the airport. Then your tax-saving price in the airport is described as a discounted price benefit to passengers. *"Duty Free" sales are slightly more complex, due to the additional (Excise) Tax levied on Liquors & Tobaccos. But, the actual (Excise) Duty reduction, or "drawback" as it was once known, on products like cigarettes or alcohol, could often be greater than the discount given to you in the stores. *In effect this means that all the (Excise) Duty Tax may not been discounted to the full either. **So, it is reasonable to assume that you are probably not getting back the full tax refund on your Marlboro or Absolut either. Just compare tobacco prices at London Heathrow, with Dubai or Istanbul Duty Free to see the difference. The Official British Government Tax Notices can be found here. It is unlikely that many travelers would want to go though all the fine print, but if you do, here is it. Previous Previous post: Can you really buy that Duty Free Apple iPhone or a Samsung Galaxy?